Most Do-It Hang Tabs are designed to hang products in retail environments. So, you might not expect to see a hang tab in a doctor’s office. But the people of Professional Disposables International, Inc. have found a use for Do-It’s R-JAK Fold-up Hang Tab in the medical world. 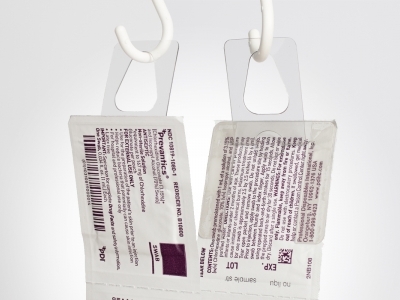 The R-JAK Hang Tab is hanging a strip of nine antiseptic wipes in doctors offices throughout the United States. The R-JAK holds the strip securely so medical personnel can quickly and easily access the wipes and tear one packet off the strip at a time.